Virgin Galactic released video from SpaceShipTwo’s flight test last Friday, January 10, 2014. This was the third supersonic, rocket-powered test of the Virgin Galactic system after dozens of successful subsonic test flights. The pilots Dave Mackay and Mark Stucky tested the spaceship’s Reaction Control System, the newly installed thermal protection coating on the vehicle’s tail booms, and the “feather” re-entry system, all with great success. See some images from the flight below. You can read our coverage from Friday’s test flight here. 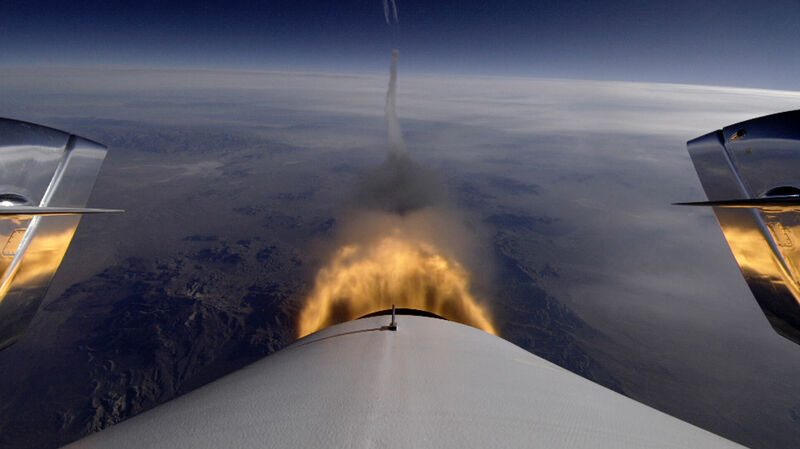 Image from SpaceShipTwo’s third powered flight on January 10, 2014. Credit: Virgin Galactic. Feathered Flight during Virgin Galactic’s SpaceShipTwo’s third powered flight on January 10, 2014 over the Mojave desert. This image was taken by MARS Scientific as part of the Mobile Aerospace Reconnaissance System optical tracking system. In true Richard Branson flair, the founder of Virgin Galactic has a multimedia plan in place for when he and his adult children, Holly and Sam, take the first planned tourist spaceflight next year. Virgin Galactic and NBCUniversal signed a “multi-platform partnership” for the network’s affiliates to transmit the flight all over the place. Disclosed platforms so far include CNBC, MSNBC, NBCNews.com, Syfy and The Weather Channel. They also plan a “primetime special” on NBC on the launch’s eve, and to host a live event for three hours on NBC’s Today show. Financial terms were not released. Virgin’s SpaceShipTwo is in the midst of powered flight tests and the company has hundreds of people signed up for flights. The company is one of several American contenders to run space tourism flights regularly, with XCOR Aerospace and Amazon founder Jeff Bezos’ Blue Origin among the most cited competitors.